With the success that hybrid propulsion enjoys in cars, the idea of adapting a similar principle for boats doesn’t seem far-fetched. In January 2008, when Steyr Motors introduced the first production hybrid for boats at the Düsseldorf boat show, it looked like a stroke of genius. It immediately was likened to the Toyota Prius, because it married two familiar systems: a convenient marine diesel engine and a quiet, clean and cute electric drive. Headlines followed, along with innovation awards at METS (the Marine Equipment Trade Show) in Amsterdam and IBEX (the International Boat Builders Exhibition & Conference) in Miami. “OEMs and boat owners [now] are calling us,” says Rich Alley, general manager of Steyr North America, about the exposure the technology has received. “We are also getting more inquiries from dealerships.” But then the economy intervened, and gasoline prices plummeted. So the stampede has yet to happen. This hybrid drive was born to take advantage of legal loopholes in Europe, where powerboat operation on freshwater lakes often is restricted. To prevent pollution and overcrowding, authorities in some regions ban operation of gasoline- or diesel-powered pleasure boats during the summer months, or they no longer issue new registrations for such boats. However, these limitations do not apply to electric craft, so Frauscher, a small family-owned Austrian builder in business since 1927, teamed up with Steyr to develop a hybrid solution to satisfy both the law and the customer. “Because of our special legal situation here [in Austria], alternative propulsion has been an integral part of our business since the 1950s when we started building electric boats,” says Stefan Frauscher, the company’s sales manager. The solution was the Steyr hybrid that consists of a monoblock diesel engine and an electric motor that is attached to the flywheel and is decoupled with a clutch in electric propulsion mode. To go back and forth between diesel power and silent electric cruising mode, the boater flips a switch on the dashboard. 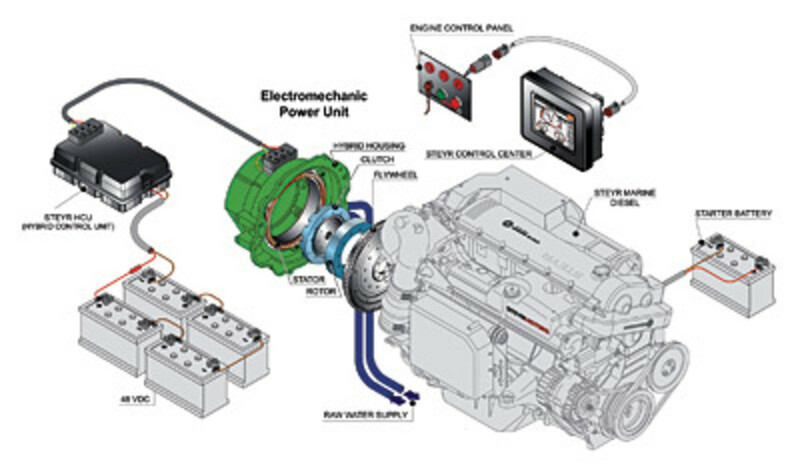 The 48-volt electric motor also acts as a starter, a generator and a booster for the diesel during acceleration. It gets power from two AGM battery banks that are charged via a controller. Recharging the batteries to full capacity takes approximately an hour when running the diesel or 12 hours when plugged in at the dock. Battery power, Frauscher says, is good for approximately an hour of electric propulsion, depending on throttle discipline. Steyr is not a household name to U.S. consumers, even though some may have used Steyr products. It is an Austrian industrial conglomerate that’s named for a city in the federal state of Upper Austria. It once was state-owned, and has been in business since 1864, making military and hunting rifles, bicycles, motorbikes, cars, trucks and tanks. In 1922, it started building monoblock diesel engines, and, in the 1980s, the company manufactured marine diesel engines for OMC. In 1990, the engine division became Steyr Motorentechnik GmbH, which developed the M1, the first electronically controlled marine diesel. In 2001, the company was renamed Steyr Motors GmbH and in 2006 it established a US subsidiary, Steyr Motors North America Inc. in Panama City, Fla.
Alley, Steyr’s U.S. general manager, says signing up distributors is just a matter of time, now that people recognize the brand. He just added a distributor in the South, AER Supply in Seabrook, Texas, and is looking for more in California and in the Great Lakes area. Island Pilot is the only U.S. production company that offers Steyr hybrids in a production boat (the DSe Hybrid 12M), while Sea Ray says it is evaluating the technology. Steyr hopes that “light” and “compact” are the two attributes that will win the day for its product. A Steyr 6-cylinder 250-hp diesel weighs 709 pounds, and the hybrid drive (which only fits Steyr engines) adds 165 pounds and 4.2 inches to the bell housing. Models range from a 55-hp 4-cylinder to a 295-hp 6 cylinder. For information, visit Steyr Motors North America at www.steyr-motorsna.com.